Certified Professional Facilitator for another 4 years! Recently I graduated and was recertified as Certified Professional Facilitator (CPF) for another 4 years with the International Association of Facilitators (IAF). In 2008 I passed my first assessment, when I was judged by 2 senior CPF Assessors. IAF's aim of the certification process, started in 2003, is to ensure that Certified IAF members meet the standards of dealing with different and complex situations as facilitator. Through this program IAF wants to ensure and maintain high quality standards for the profession of Facilitation. 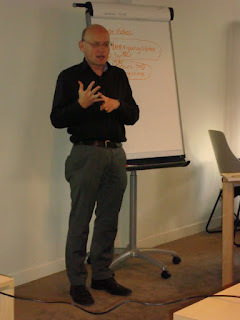 Facilitation is an Art and experience as must!.